7 Steps Towards Breaking the Lower Desires. 1) Continuously praying the dawn prayer [Fajr] on time. The Nafs doesn’t want to wake up early, for extra sleep fuels the desires. 2) Reading the Quran immediately after the Fajr prayer. The Nafs doesn’t want to read right upon awakening and then praying. 3) Meditate and perform your daily spiritual litany [Wird/Awraad] before work. The Nafs doesn’t want to sit still and be at ease in a busy world. It’s ready to go. 4) Go to work and then be at ease. The Nafs doesn’t like hard work and will try to take the easy way out. One thing that we shouldn’t get confused though, is that wage slavery is not hard work and is classified as oppression. However, if you do find yourself within this situation and are physically and mentally working hard through it, then be patient, for the Nafs doesn’t like to stay patient and it wants what it dreams and aspires for immediately. Remind it that everything comes within its proper time. 5) Be nice to people at work. The Nafs doesn’t want to give people the benefit of the doubt and it will try to accuse everyone else around you for your own troubles at work. If the employee that annoys you works with you, then understand that they may be going through similar, difficult circumstances and thus one has to have mercy. The Nafs doesn’t want to have mercy and it wants retribution for what or whom it thinks harmed it, right away. It’s why many arguments may happen at work. 6) Be calm while coming home and do not involve yourself in road rage and obey the lights and signs. The Nafs doesn’t like to be told what to do, and it most certainly doesn’t like to be worried and perturbed when tired; but you have to train it to be quiet and to accept the traffic, heat or whatever the case of discomfort may be. Remember, everyone else is going through the same thing you are. It should be really a time of unity on the road and not one of recklessness. Many lives are at stake on the roads everyday and we have to be thoughtful. 7) Greet the family with a smile each and everyday. The Nafs doesn’t want to be happy go lucky after having gone through a hard day at work and it will want to be served immediately. Just know, that it’s an obligation for the husband to provide for the family according to Allah and the Sunnah, so you are not to think of yourself as a savior. Allah has proven that after divorce or death, someone else could easily fill that spot, whilst performing all of the above duties. The Nafs doesn’t like to hear this, but it’s true. Please take these 7 noted examples and try your best to implement them. There are many more, and Allah Knows Best. I haven’t posted something in days! I read this article not to long ago. It was beautiful, please enjoy. The best Test I have taken on the subject to this date. It was recommended to me by my teacher. The Myers-Briggs Type Indicator (MBTI) is a personality test based on Carl Jung’s theory of types. The test determines the preferences people have in terms of how they see the world and make decisions. These preferences are what shape a person’s interests, values, motivations, skills and needs. Reaching Allah subhanu wa ta’ala. “‘Ibādah is one thing, trying to reach Allāh ta’ala is another.’ People do lots of ‘ibādah in Ramaḍhān, but they do it as they please, without any objective or guidance. Their condition can be likened to someone who wants to get fit, and so enthusiastically starts to diet and exercise, but only lasts a few days before giving up. If they were to consult a dietician, they would be given a diet and an exercise programme that would enable them to achieve their goal. Being a introvert I found this to be on point. To such an extent sometimes introverts themselves fall into these misconceptions and think they are not “normal” as if that word was ever defined. There was a situation that I observed for the past couple of months. It was so frustrating and annoying to hear and see it every single day happening over and over again without any change in approach or action. On the outside it was just one person being to lazy to do something for the other. Now we all have our days and moments where we just don’t want to work or do anything. I can acknowledge that but on everyday basis though? Seriously? But laziness was the branch of the issue. We learn from the religion of Islam that problems usually have branches which are just the outward manifestations of problems. But to truly fix a problem one has to go deep down through the soil to the roots and cure it from there. In other words, go to the heart. The problem or issue this particular person had was that they were selfish. 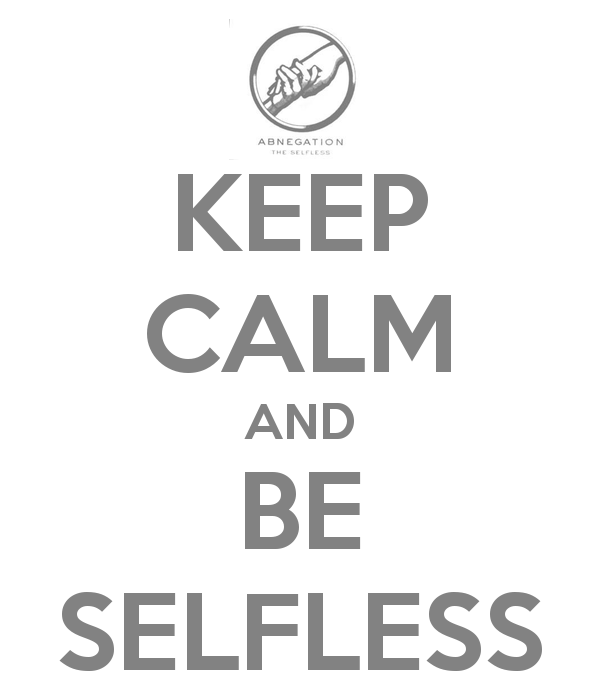 Now the word selfish can have a negative connotation but there are many types of selfishness and not all are bad but rather needed at times. But in this particular case it was one person choosing their need of “bumming” it or relaxing over the other person’s need. Now that may be okay sometimes but one really has to think to themselves that is their person’s need more important than my need? Most of the time when your comparing your “bumming it” need to theirs, they will always have the greater importance. If any relationship wants to prosper and become bliss then I feel it is incumbent upon those such individuals to become selfless beings. To learn to choose the needs whether they be physically, mental, intellectual, or spiritual of the other over one’s own needs when the time and setting is right. Only when both parties sole purpose is trying to please the other will they find peace and tranquility in their relationship. If selflessness is to high of a status to aim for then at the very least being considerate would suffice. There’s nothing that ticks me off and boils me over more when I see a person in need and when that person ask’s their partner for assistance they just shrug it off as if they have no heart to begin with. But it always surprises me to how blind people are of this and how these things just pass by their eyes without even a hint of notice. But then again I can’t blame them. I think the only reason I am like this is first and foremost from the mercy of My Creator upon me and secondly my mother. Everyone obviously has a soft part for their parents or family and will sometimes exaggerate their qualities out of their love and reverence for them. However, it’s no exaggeration when I say that my mother is one of the most selfless people I have known to point. The way she serves our family tirelessly day in and day out without even asking for the simplest thanks or gratitude is truly something I wish to aspire to. It would bring me great honor and fame if one were to say that I am my mother’s son. To be like her would be a achievement worth striving for. Fortunately, from the grace of God I have been given some of her heavenly qualities innately in my personality that need to be harnesses and developed and hope that my spouse also shares her qualities one day as well. This started off with anger and became a rant. Later it formed into a reflection and then a solution. It ended with acknowledgment, being grateful, and aspiration. Sorry for the incoherent emotions. 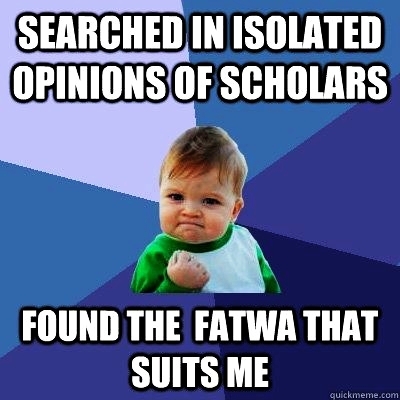 Take the the relied upon opinions in Deen not the outliners.